I grew up eating a lot of shepherd’s pie and loved it. But I’ve recently discovered what it should really be. Shepherd’s pie and cottage pie are often used interchangeably. However, some people will reserve “shepherd’s pie” for a recipe made with lamb or mutton, and “cottage pie” for a recipe using beef (since shepherds look over sheep, not cattle). Most people are familiar with recipes that use ground meet. That makes OK cottage pie, but you’re missing a lot. The dish originated from the desire to use leftover roasted meat or stew. 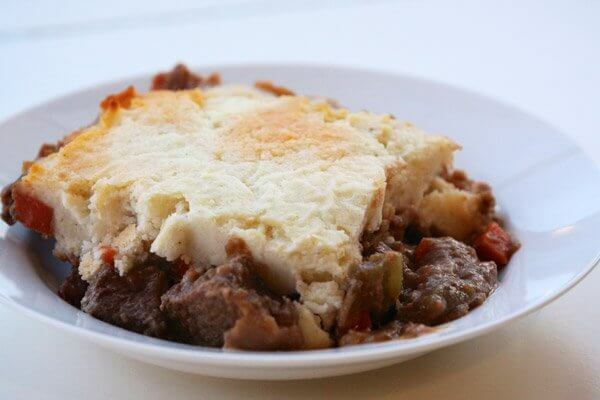 So where cottage pie gets really exciting is when it uses a stew of slow-braised beef chuck. You get much more flavour from the meat and a much nicer texture from the flaky chucks of beef. While this Fine Cooking recipe doesn’t use leftovers per se, it starts by making a beef stew using beef chuck. I diced my beef larger than the recipe calls for, so I simply let the stew braise a while longer. What’s great is that you can definitely make the stew a day or two in advance, and then make the mashed potato topping and bake the cottage pie later. And the cottage pie itself is great as leftovers for weekday lunches. You’ll never go back to ground beef cottage pie again!